TVs are getting so thin that even supermodels would say to them “steady on mate, have a bag of chips!” This latest OLED model from LG is no exception. The firm has revealed a new OLED “wallpaper” display that its just 0.97mm thick and can be easily stuck on a wall using just a magnetic mat and then peeled off. The 5-inch display weighs only 1.9kg and was unveiled at a press event in Korea this week. The display is much thinner than the company's current flagship model which looks positively obese at 4.3mm. However, the display is more of a proof of concept model than anything that is likely to grace our living rooms in the next twelve months. The reason: OLED is notoriously difficult to produce with low yields pushing up the price to consumers. But LG appears upbeat about the prospects of getting the tech into our living rooms and is boasting of how it's no longer breaking so many panels in the manufacturing process. Slow hand clap. LG Display's OLED business unit president Yeo Sang Duk said that OLED is “the ultimate display technology”. “We will ramp up efforts to boost the market with our full-fledged production starting from the third quarter,” he told reporters at the press conference. 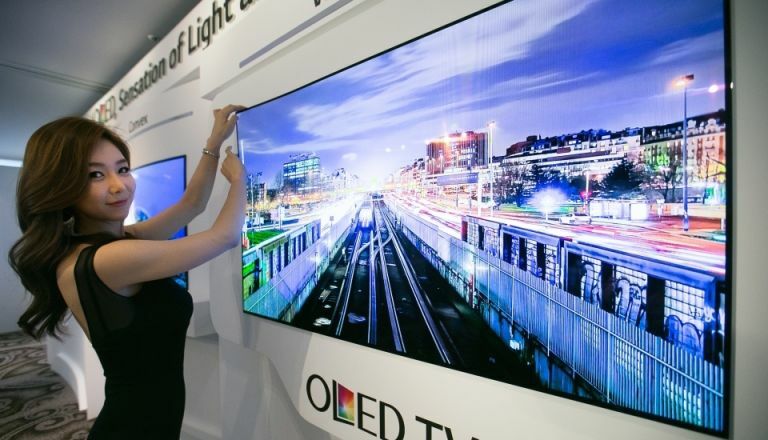 The firm expects to sell around 1.5 million OLED TVs in 2016, double this year's expected 600,000 units. Oh, and size matters too - LG anticipates producing OLED displays as big as 99-inches within the year.